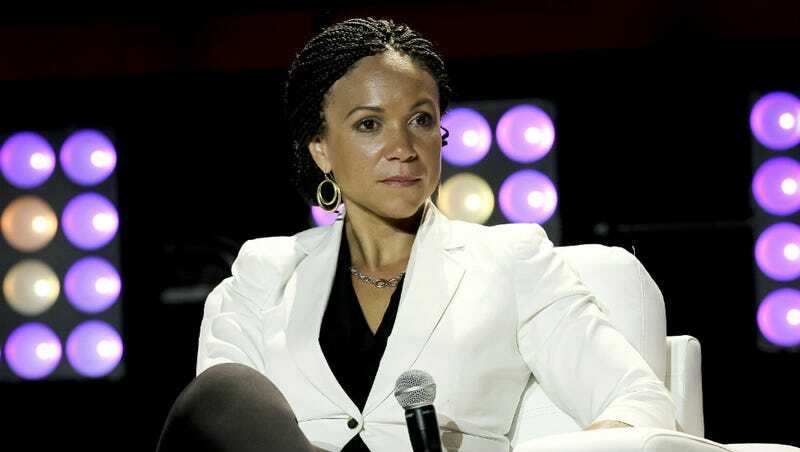 MSNBC host Melissa Harris-Perry says she had a bizarre and threatening encounter with a stranger in Iowa this week, where she’d taken a group of students from her politics class at Wake Forest University to observe the Democratic caucuses. I am not sure if it is how he spat the word credentialed, or if it is how he took another half step toward me, or if it is how he didn’t respond to my question, but the hairs on my arm stood on end. I ignored it. Told myself everything was ok.
“Well. It is not exactly a credential…” I began. Now I know something is wrong. Now his voice is angry. Now a few other people have stopped talking and started staring. Now he is so close I can feel his breath. Before I can answer his unanswerable question of why they picked me, he begins to tell me why he has picked me. Oh – there is a this. He is going to do a this. To me. And he is going to tell me why. I freeze. Not even me – the girl in me. The one who was held down by an adult neighbor and as he raped her. The one who listened as he explained why he was doing this. She freezes. Instead of sitting still as he tells me what he is going to do and why, I jump up. I move. I put space – a table – between him and me. My friend jumps too. It is breathtaking how fearlessly – almost recklessly – she throws herself between he and I. Together we raise our voices and make a fuss. He turns. He runs out. He jumps in a car. He drives off. We try to explain to hotel security what has happened and how I receive hate mail and even death threats, how I have had people show up at my workplace, how this might be serious. They listen politely, but this is the Iowa caucus, and I am not a candidate, so they go back to their evening. And we go back to ours. Now that is a teacher to the core.